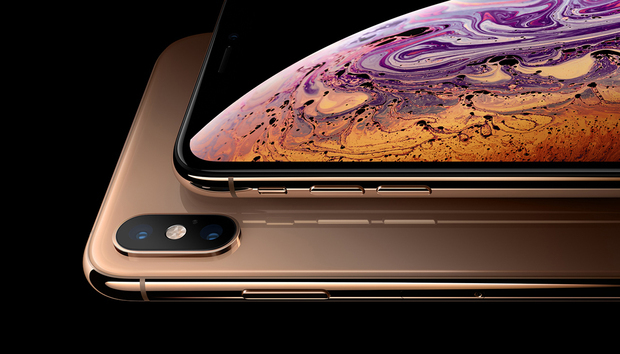 So that $1,000-plus sticker shock didn’t put you off from upgrading to the poorly-named iPhone XS or even-worse-named iPhone XS Max. I don’t blame you—I bought the one, too. I know you want to dive right in the moment you get the box in your hands, but take a beat and do a little prep first! We have a little setup advice you’re going to want to pay attention to. Sure, it seems like an unnecessary drag, but this stuff is going to really save you a lot of time and frustration later. When the backup is done, connect your new iPhone XS, then tell iTunes you want to restore from the backup you just made. Or, skip down to #2 below and use Quick Start. Later, you can switch back to iCloud backups if you prefer, in Settings > iCloud > Backup. But it never hurts to run a backup on your own Mac every now and then. For an iCloud backup: No need to connect your iPhone to your Mac. Just launch Settings and tap on your Apple ID profile listing at the top, then go to iCloud > iCloud Backup and select Back up now. When setting up your new iPhone XS, you can restore your iPhone from this backup once you’ve logged into your new device with your Apple ID. If you happen to be coming from an Android phone (hey, welcome to the garden! ), there’s an Android Move to iOS app that can assist you with getting all of your your Google account data in Mail, Calendars, and Contacts, moving your camera roll over, even transferring your Chrome bookmarks to Safari. 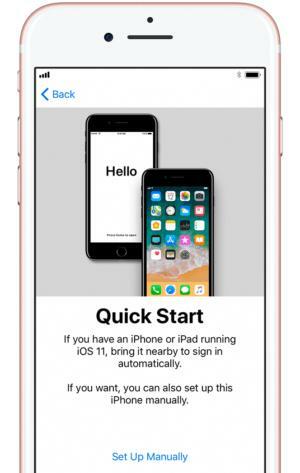 iOS 11 introduced a really great new feature called Quick Start. It’s practically magic. You just hold your new phone next to your old phone, and a little card pops up asking if you want to transfer all your stuff to the new device. You’ll then point your old phone’s camera at your new phone (which displays a cloud of little dots) and enter your old phone’s 6-digit passcode. Setting up your phone this way transfers over most of your settings, the arrangement of your home screen, and more. It’s a huge time saver. But it requires iOS 11, so if you haven’t updated your old phone to iOS 11 (or iOS 12) for some reason, you might want to update right away. You don’t want to have to wait through a big update process once you have your iPhone XS in hand. After setting up your phone this way, you’ll want to give it a few minutes to re-download all your apps. Initially, your phone will show placeholders for your apps, all arranged and stuffed into folders exactly as on your old iPhone. But your new phone has to actually re-download apps, because every time you download an app from the App Store, your phone actually grabs a unique version specifically optimized for that iPhone model. But your user data and settings get transferred over, and that's the important part. Yes, you should use Face ID for maximum security—it’s the quickest way to unlock your iPhone XS, and will make it less painful to use a complicated passcode, since you don’t have to type it in every time. Setting up Face ID is much faster than Touch ID, too—the setup screen will prompt you and ask you to slowly look around in a circle a couple times. It’s a lot quicker than tapping the home button dozens of times to register a fingerprint. Great, now you should be on your home screen on your new iPhone, at last. Hit up the App Store first—you’ll want the latest versions of all of your apps in order to take advantage of all the new abilities Apple has given developers in iOS 12. If you used Quick Setup, most of your apps should be up to date already, so this will be, er, quick. If you use an Apple Watch (or maybe you just bought a brand new Apple Watch Series 4 to go with your future-phone) you’ll need to pair it to your new iPhone to keep the Activity data flowing to your Health database, and keep your new phone’s notifications flowing to your watch. First you have to unpair your watch from your old iPhone, either in the Apple Watch app on your old iPhone (tap your watch, then the “i” icon, then Unpair Apple Watch, then enter your iCloud password when prompted), or on the watch itself (Settings > General > Reset). Then, launch the Apple Watch app on your new iPhone XS, which will walk you through the pairing process including setting a passcode, unlocking behavior, and Apple Pay. If your Apple Watch isn’t already running watchOS 5, you’ll want to update it. To upgrade, your Apple Watch needs to be connected to its charger, in range of your iPhone, and at least 50 percent charged. Then look for the Software Update option in the Watch app. Updating your Apple Watch can be a slow process, so it's a good idea to get started early. As you may have noticed, your iPhone XS has no home button. Where the Home button used to be, you now have an extra half-inch or so of glorious OLED display! If you're coming from an iPhone X, it will of course be totally familiar. But if you're upgrading from an older iPhone, you've got some new gestures to learn. Close an app: If you need to kill an app from the app switcher, simply swipe up on it. On iOS 11, the iPhone X had an annoying press-and-hold gesture to do this, but Apple simplified it to a basic swipe-up move in iOS 12. 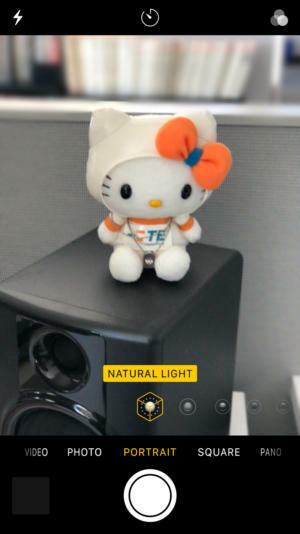 If you're upgrading from a Plus-model iPhone, you already know about Portrait Mode in the camera app. But only the iPhone 8 Plus and X had Portrait Lighting, which of course continues to be available on the iPhone XS. Just launch the Camera app and select Portrait from the camera modes at the bottom of the screen, and then swipe through the different lighting options. The iPhone X introduced Portrait Mode on the front-facing camera, so unless you're upgrading from that, it will be a new feature for you on the iPhone XS. 8. Charge it up, quick! There’s a reason your new iPhone XS has that shiny glass back, and that’s not because it’s a throwback to the iPhone 4. No, that glass back is for wireless charging support. To use this feature, you’ll need a compatible wireless charging pad that utilizes the Qi standard (we've tested a bunch, and here are some of our favorites). If you have one of those laying around, all you have to do is set your iPhone onto the pad and watch it start to power up. Say goodbye to the jumble of Lightning cables on your bedside table! Of course, you can charge your iPhone XS via Lightning if you want to. In fact, this is still the fastest way to charge your phone, provided you use the right adapter and cable. 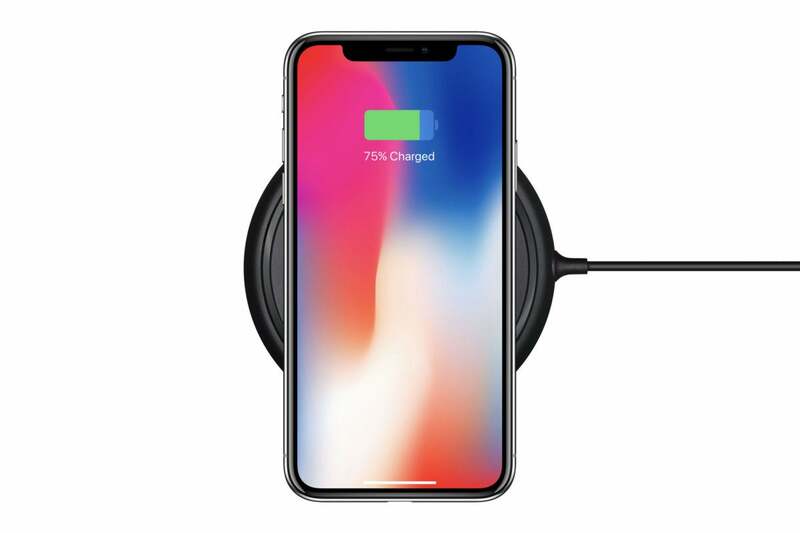 The XS supports fast charging using the USB-C Power Delivery (USB-PD) standard. You can use Apple’s own 29W USB-C power adapter, or the USB-C power adapter for a modern Macbook Pro. But third-party USB-C power adapters should work as well, as long as they support the USB-PD standard. We tested all the official Apple power adapters along with some third-party choices, and found that the 12W iPad adapter is the sweet spot between price and performance. I know it’s silly, but the best way to brag about your new iPhone is to send someone an iMessage that shows the Poo Emoji perfectly lip-synced and following your facial expressions as you sing “Bohemian Rhapsody.” They will be so jealous. If you send a singing poo to your friends, they’ll know you bought a new iPhone. It’s that simple. Animoji are cool, but iOS 12 takes them to the next level with Memoji. 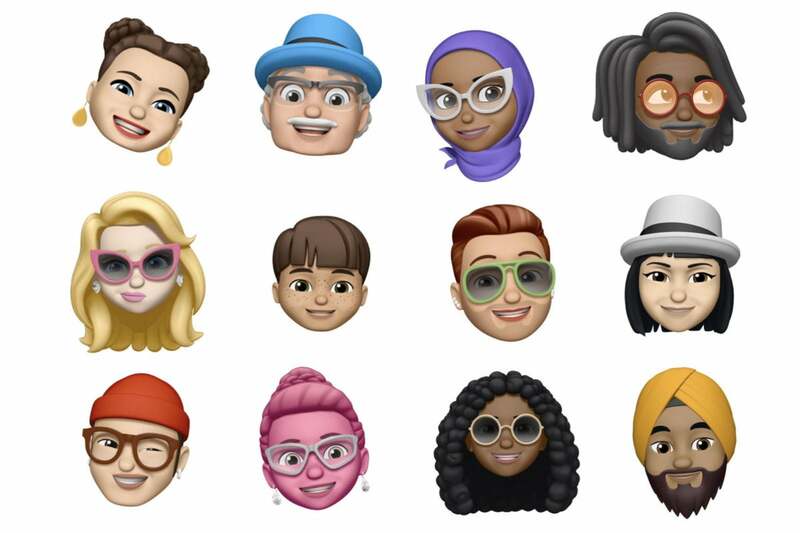 If you're upgrading from an iPhone X, you may have already upgraded to iOS 12 and created a Memoji. 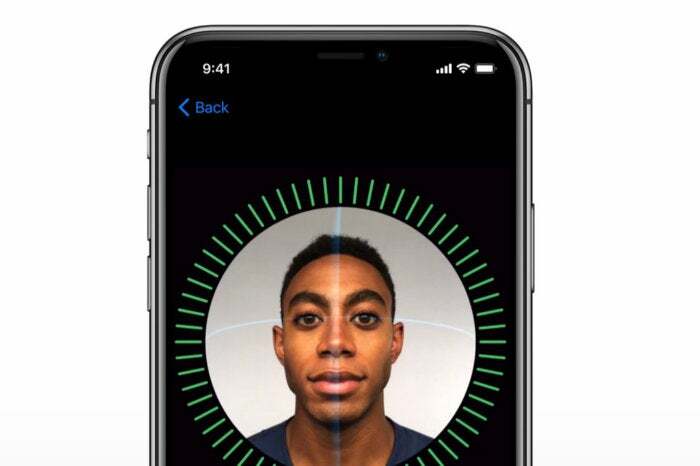 If the iPhone XS is your first iPhone with a the TrueDepth front camera system, it's your first opportunity to build your cartoon avatar. If the iPhone XS is your first TrueDepth camera-enabled iPhone, it's time to make your Memoji! Start by opening the Messages app, and then stating a new message or opening an existing thread. Tap the Animoji icon along the bottom, and then the + sign at the beginning of the Animoji list. We have a step-by-step Memoji guide to walk you through the process.